undertake development and settlement of an "empire" located next to the Colorado. On July 17, 1877, Blythe filed his first claim for Colorado River water on what was to become the "Blythe Intake". Blythe appointed another man named George Irish as manager to assist Calloway in building an irrigation system. Calloway died in a Chemehuevi attack in March 28, 1880, and was replaced by C.C. Miller, the father of Frank Augustus Miller. Thomas Blythe died on April 4, 1883; his only revisit to the valley was in November 1882. After his death, the work in the valley halted and Blythe's estate subsequently went into litigation between his illegitimate daughter Florence and other claimants, the trial beginning on 1889. By the 1900s, Florence was awarded the estate, after several years of preceding rulings in favor of her and appeals against her. 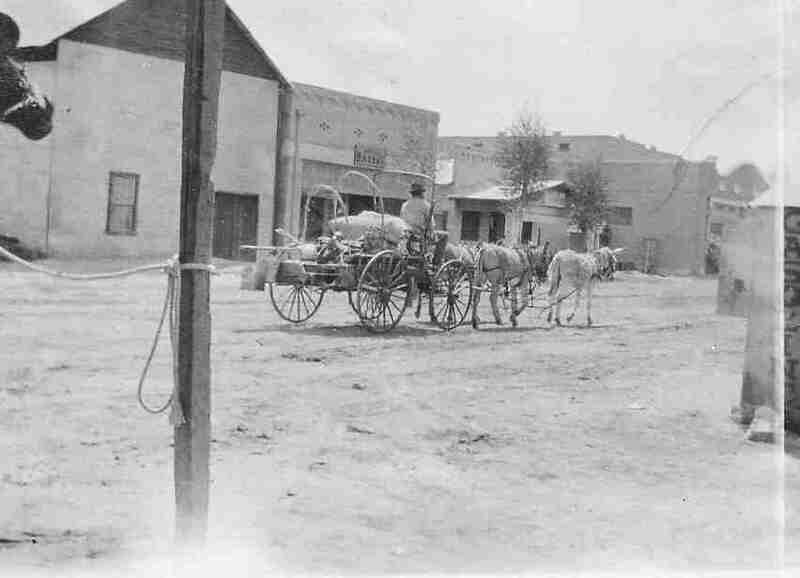 Frank Murphy and Ed Williams, who were involved on the cattle industry in southeastern Arizona, came to the area in 1904 and were convinced it was well-suited for cattle and farming. With the Hobson brothers from Ventura County, they bought Blythe's estate and formed the Palo Verde Land and Water Company. During 1911–1912, W.F. Holt, who helped develop nearby Imperial Valley, was the company's general manager. On August 8, 1916, the California Southern Railroad reached Blythe from the desert station of Rice, then known as Blythe Junction. It was later renamed to honor G.W. Rice, an engineer and superintendent of the railroad. The dramatic growth in the valley following this event attracted national attention. Production totals increased annually from virtually nothing to near $8,000,000 in few years, primarily from cotton and cotton seed shipped to the ports. The lower cotton prices in 1920 ended this prosperous time. The Atchison, Topeka and Santa Fe Railway began leasing the line in 1921 and acquired it in the end of 1942. In 1935, the completion of Boulder Dam extinguished the destructive annual floods in the valley. As noted in the city's fiftieth anniversary, some forty crops were grown in the farms, and large cattle feeds were another aspect of the agriculture industry. Nearly two decades earlier, the Fisher ranch had the biggest herd of registered Brahman cattle in California, the breeding stock having been sold to western states and other countries. During World War II, Blythe was the site of United States Army Air Forces facilities in the Blythe Airport and the Gary Field. The first automobile bridge over the Colorado River between Blythe and Ehrenberg was constructed in 1928 to replace a cable ferry service. The bridge's successor was built in the early 1960s and it was expanded to four lanes and a pedestrian walkway in early 1974. In 1972, Interstate 10 was built through the city, replacing US 60 and the previously decommissioned US 70 in Hobsonway as the main thoroughfare. In 2016, the voter-approved recreational use of cannabis in California has made the cannabis industry drawn to the economically declined city due to lower land prices, water, and potentially lower taxes compared to other parts of the state. One of the proposed cannabis facilities, Palo Verde Center, would be one of the largest in North America. Blythe is located near the California/Arizona border in the Colorado Desert section of the Sonoran Desert, at the junction of Interstate 10 and US 95. According to the United States Census Bureau, the city has a total area of 27.0 square miles (70 km2), of which 26.2 square miles (68 km2) is land and 0.8 square miles (2.1 km2) (2.9%) is water. Nearby communities include Lost Lake and Vidal to the north, Ripley to the south, Desert Center to the west, and Ehrenberg, Arizona, to the east. Major cities in the region include Yuma (85 miles), Indio (95 miles), Phoenix (150 miles), San Bernardino (170 miles), Riverside (172 miles), and Las Vegas (200 miles). Blythe is within 4 hours via car of 10% of the United States' population. Blythe has a hot desert climate, featuring extremely hot summers and mild winters. There are an average of 178.4 days with highs of 90 °F (32 °C) or higher. There are an average of 18.9 days with lows of 32 °F (0 °C) or lower. Until 2016, the record high temperature was 122 °F (50 °C) on July 7, 1920, and June 24, 1929. But on June 20, 2016, that long-standing record was shattered when Blythe reached 124 °F (51 °C). The record low temperature was 5 °F (?15 °C) on January 6, 1913. There are an average of 16 days with measurable precipitation. The wettest year was 1951 with 8.71 inches (22.1 cm) and the driest year was 1956 with .18 inches (0.46 cm). The most rainfall in one month was 6.00 inches (15.2 cm) in August 1951, which included the 24-hour record rainfall of 3.06 inches (7.8 cm) on August 27. At the airport, there are an average of 176.0 days with highs of 90 °F (32 °C) or higher. There are an average of 5.4 days with lows of 32 °F (0 °C) or lower. The record high temperature was 124 °F (51 °C) on June 20, 2016. The record low temperature was 20 °F (?7 °C) on January 8, 1971. There an average of 17 days with measurable precipitation. The wettest year was 1992 with 9.16 inches (23.3 cm) and the driest year was 1953 with .59 inches (1.5 cm). The most rainfall in one month was 5.92 inches (15.0 cm) in August 1951, which included the 24-hour record rainfall of 3.00 inches (7.6 cm) on August 26. Tourism is a major component of the local economy. Blythe is a stopover city with full services for travelers between any of the nearby regions, in particular the major cities of Los Angeles and Phoenix, since it is approximately midway between those two metropolitan areas. The winter months bring visitors avoiding the colder climates of the north, when the population of the area within 50 miles (80 km) of Blythe has been known to exceed 500,000. Con-Way freight has a large facility here. It is used mainly at night for cross dock operations, as there is seldom a need to make deliveries here. Blythe also contains 24 churches, one library, two newspapers (Palo Verde Valley Times, The Desert Independent), two museums, two radio stations (KERU-FM  and KJMB-FM ), three banks, a three-screen movie theater (now closed), one funeral home and an 18,500 sq ft (1,720 m2). recreation center. The area is popular with campers and hikers and has six parks, seven campgrounds, seven RV parks, 3 boat ramps onto the Colorado River, and an 18-hole public golf course. Blythe hosts the Blythe Blue Grass Festival annually the third weekend of January. Dove hunting is popular in Blythe. The hunting season starts every September 1. Needles (Mojave: ?Aha Kuloh) is a city in San Bernardino County, California, United States. It lies on the western banks of the Colorado River in the Mohave Valley subregion of the Mojave Desert, near the borders of Arizona and Nevada and roughly 110 miles (180 km) from the Las Vegas Strip. It is the easternmost city of the San Bernardino-Riverside metropolitan area. Needles is geographically isolated from other cities in the county. Barstow, the nearest city within the county, is separated from Needles by over 140 miles of desert and 2 mountain ranges. The city is accessible via Interstate 40 and U.S. Route 95. The population was 4,844 at the 2010 census, up from 4,830 at the 2000 census. The Mohave, one of the traditional Colorado River Indian Tribes, are Native Americans that have been living in the Mojave Valley area for thousands of years prior to the European exploration of the area. In the Mohave language, they call themselves the ?Aha Makhav. Their name comes from two words: ?aha, meaning "river", and makhav, meaning "along" or "beside", and to them it means "people who live along the river". These people traded with the tribes of coastal Southern California following the Mohave Trail. The Franciscan missionary Francisco Garcés, was the first European to visit the Mohave people and travel on the trail and report on the route in 1776. From 1829 to 1848, part of this trail became a part of the route of the Old Spanish Trail between New Mexico and Southern California. The city was founded in May 1883 as a result of the construction of the Atchison, Topeka and Santa Fe Railway, which originally crossed the Colorado River at Eastbridge, Arizona three miles southeast of modern downtown Needles. The name was derived from the Needles, pointed mountain peaks at the south end of the valley with wind-blown holes in them, visible only by boat from the Colorado River. This point on the Colorado River was a poor site for such a bridge, lacking firm banks and a solid bottom. Additionally, the bridge was not of the best quality, which led to criticism that it was a "flimsy looking structure", and was an obstruction to navigation, since it lacked a draw to allow boat traffic. The flooding and meandering of the Colorado River destroyed the bridge in 1884, 1886 and 1888. Finally, the railroad surrendered to nature and built the Red Rock Bridge, a high cantilever bridge, at a much narrower point with solid rock footings ten miles downstream near modern Topock. The bridge was completed in May 1890. Originally a tent town for railroad construction crews, the railroad company built a hotel, car sheds, shops and a roundhouse. Within a month the town also boasted a Chinese wash-house, a newsstand, a restaurant, a couple of general stores, and nine or ten saloons. The town became the largest port on the river above Yuma, Arizona. The railway and the Fred Harvey Company built the elegant Neoclassical and Beaux-Arts style El Garces Hotel and Santa Fe Station in 1908, which was considered the "crown jewel" of the entire Fred Harvey chain. The landmark building is on the National Register of Historic Places and is being restored. Needles, like Death Valley to the northwest, is known for extreme heat during the summer. The Needles weather station is frequently reported by the United States government's National Oceanic and Atmospheric Administration (NOAA) as the site of the highest daily temperature recorded in the U.S. during the desert summers. Needles occasionally sets national or world daily temperature records, along with other related records associated with extreme desert heat. For instance, on July 22, 2006, Needles experienced a record high low temperature of 100 °F (38 °C) at 6:00 AM with a high temperature exceeding 120 °F (49 °C), making it one of the few locations on Earth that have recorded a triple-digit overnight low temperature. Also, on August 13, 2012, Needles experienced a thunderstorm that deposited rain at a temperature of 115 °F (46 °C) starting at 3:56 PM, setting a new record for the hottest rain in world history. The air temperature was 118 °F (48 °C), tying Needles' record high for the date. Since the humidity was only 11%, the rain evaporated so that "only a trace of precipitation was recorded in the rain gauge". Weather records researcher Maximiliano Herrera reported that this was the lowest humidity at which rain has occurred on Earth in recorded history. Later, on May 4, 2014, Needles reached a temperature of 102 °F (39 °C) with a dewpoint of ?38 °F (?39 °C), for a relative humidity of 0.33%, the lowest value ever recorded on Earth. In the winter, the normal high temperatures range from 62 °F (17 °C) to 80 °F (27 °C) with lows of 40 °F (4 °C) to 60 °F (16 °C). During summer the normal high temperatures range from 106 °F (41 °C) to 122 °F (50 °C) with lows of 82 °F (28 °C) to 94 °F (34 °C). The record low temperature was 20 °F (?7 °C) on December 23, 1990. The average year has 168.4 days with highs of 90 °F (32 °C) or higher and 4.9 days with lows of 32 °F (0 °C) or lower. On June 20, 2017, the high temperature record was tied with a reading of 125 °F (52 °C). er (Mojave 'Amat Kuhwely, formerly 'Ahwe Nyava) is the county seat of La Paz County, Arizona, United States, on the Colorado River in Parker Valley. The population was 3,083 at the 2010 census. Founded in 1908, the town was named after Ely Parker, the first Native American commissioner for the U.S. government. The original town site of Parker was surveyed and laid out in 1909 by a railroad location engineer by the name of Earl. H. Parker for the Arizona & California Railway. The town officially incorporated in 1948 and became the county seat for the newly created La Paz county on January 1, 1983. The town's name and origin began when a post office called Parker was established January 6, 1871, at Parker's Landing and the site of the Parker Indian Agency, named for Ely Parker, on the Colorado River Indian Reservation, 4 miles down river from the site of the railroad bridge of the modern town, to serve the Indian agency. What became Parkers Landing was established on the river as the place to land and pick up cargo and personnel for the Indian Agency and the U. S. Army detachment that was stationed there at Camp Colorado from 1864 to 1869 during the first years of the Reservation. Camp Colorado was abandoned after wind blown sparks from the departing steamboat Cocopah rapidly burned down the brush huts of the officers of the garrison, and endangered its barracks and storehouses. The city is on the Colorado River just south of the Headgate Rock Dam and Moovalya Lake. Arizona State Route 95 and California State Route 62 (across the Colorado River) serve the city. According to the United States Census Bureau, the town has a total area of 22.0 square miles (57 km2), of which, 22.0 square miles (57 km2) of it is land and 0.05% is water. According to Census Bureau maps, the town is divided into two non-contiguous sections; the northern section consists of the original town and is located in the Colorado River Indian reservation and the southern section consists of a larger, roughly rectangular section of largely undeveloped territory. The undeveloped territory consist of extensive unpaved roads. Of the few that are paved Mohave Road is the most utilized between the town and the territory. The same road can be taken 15.5 miles south to the Town of Poston which is noted for its relocation camps for Japanese Americans during World War II.